We believe sash windows are an elegant and aesthetically pleasing addition to any period home. However, we understand that if your windows are broken or neglected, they can end up being a bugbear rather than a feature. A broken cord, for example, can render your sash windows unusable. The good news is that you can fix some of the more minor problems yourself in a few easy steps – using our restoration kit. Here's how to do it. A safe working area should made around each window, dust sheets placed on the floor and light polythene plastic used to cover furniture to ensure everything is fully protected. Missing putty to the glazing rebate: this can leave the glazing loose and dangerous; ensure there is a clear area below all windows above ground floor level before you start work. When sash cords are broken the windows are sometimes nailed or screwed in place. 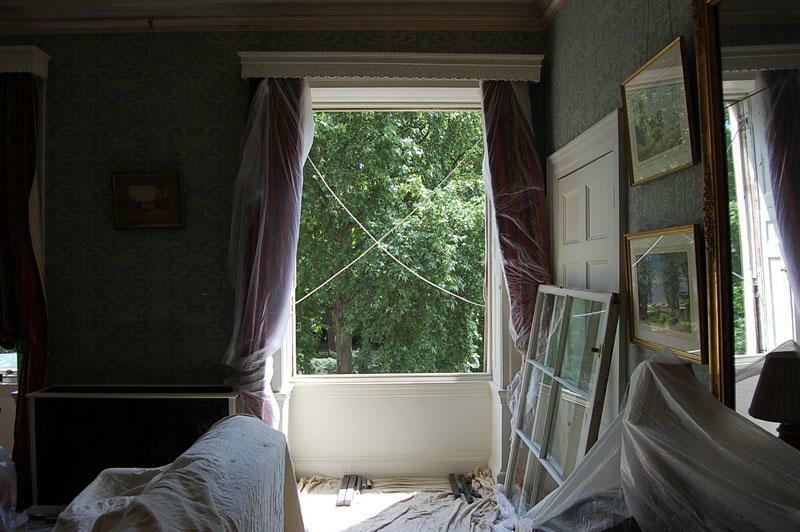 Freeing the top sash incorrectly can lead to it falling down, causing broken glazing and even injury. A line should be scored down the joint between the left and right hand of the staff beads; this allows removal of the bottom sash. This breaks the paint joint of the inner lining of the box frame and the staff bead and paint flaking and chipping to the lining and staff, keeping any damage to the interior decor to a minimum. If the top and bottom sashes are painted closed on ground floor level properties a line should be scored with a Stanley knife on the outside of the sashes along the parting beads and outer linings, to free them up. Next remove the staff beads from the window. Bending these in the middle helps with the removal and the nails are then pulled through the inner face of the bead with a pair of pincers. This will stop the nail damaging the timber and the paintwork. The sash cords to the bottom sash (if not already broken) should be cut or nails removed from the sash cord at the lowest possible point. Then tie a knot in the cord to stop it falling through the pulley wheel and the weights falling down the weight cavity, which can damage the lower sections of box frame. The sides of the sash styles are marked just above where the sash cord groove finishes and a measurement taken from the bottom of the sash to the mark. This measurement is then transferred onto the box frame from the top of the sill up to the pulley stile and marked again. This ensures you get the correct length for the new traditional waxed or nylon cord. Then remove the bottom sash. For the top sash, score a line down both parting beads to break the paint joint to minimise damage to the decor, then both parting beads are removed. If it is a ground floor window where the top sash is painted shut, a score a line with a Stanley knife to the outside of the parting. Then secure the top sash if necessary (this is assessed earlier as described in step 2). Mark a line just above the end of the groove for the sash cord and then mark the sash too. Take a measurement from the top sash to this mark (as described in step 5 this is needed for gaining the correct length of the new wax or nylon sash cord). This measurement is then transferred onto the box frame, ready for the fitting of the new sash cords. As with the bottom sash, the cords are cut or nails removed from the sash cord at the lowest possible level and a knot is tied to the bottom of the cord to stop the weights falling and damaging weight cavity and the lower sections of the box frame. Remove the weight pockets which are normally found in the lower inner sections of the pulley stiles, where the bottom sash slides. The knot tied in the sash cord should then be undone and the weights lowered and removed. Check the inner edge of the outer lining as excess paint reduces the gap between the outer lining and the parting bead. This creates problems for the top sash sliding up and down. The groove to the pulley for the parting should be cleaned and sanded, ensuring the parting bead can be fitted correctly. It is quite common for parting beads to break while being removed; so replace any broken or rotten parting beads. Remove any excess paint and the check the pulley wheels are checked. Then the lower sections of the box frame should be checked and any dust or rubble at the bottom of the weight cavity removed. A new wagtail should be fitted to both sides if there are no wagtails present or if they are broken (a wagtail is a small strip of timber that separates the counter balance weights). The top and bottom sashes and weights need to be weighed and necessary adjustments made to ensure the correct counter- balance weight for the sashes. The weights to the top sash should be 2lb heavier than the sash itself and the weight for the bottom sash should be about 1lb less than the bottom sash itself. This ensures that when the top sash is closed it never creeps back down leaving a gap between the top rail of the top sash and the head pulley stile. It also ensures the sashes stay in their desired position when opened. Then, fit the sash cords and the correctly balanced weights and install the new heavy duty nylon sash cords or traditional waxed sash cords. Follow this with the refitting of the weight pocket. Re-hang the top sash and test for full movement. The cords are always screwed - this stops the risk of breaking any glazing to the sash as the vibrations from hammering nails into the sash cords can cause the glass to crack. Now inspect and fit the parting beads. Now seal the parting beads with mastic (it is easier to seal the parting beads while the bottom sash is out). The bottom sash should be re-hung and checked for easy sliding and also full movement up and down. Staff beads are now refitted and sealed with mastic and pin holes to staff beads should be filled. 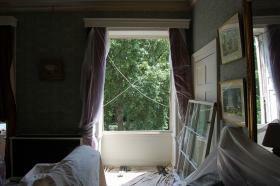 Your window is now restored to full working order and you can complete the cleaning up process. We hope that our step-by-step guide is so easy to follow that you will be able to repair your sash window all by yourself. If you do get stuck however, feel free to send us an email and we can talk you through the problem – or if you feel it's too much to tackle, we can come out and do it for you!